An opportunity to spend a month at Navdanya’s beautiful Bija Vidyapeeth learning from the Earth, biodiversity, farmers & agro-ecologists on creating agroecological systems for the health of the planet and the people. Faculty: Dr Vandana Shiva, Andre Leu, Gilles- Eric Seralini, Jerome Douzelet, Dr. Mira Shiva, Dr.Av Singh, Dr.Salvatore Ceccarelli, Marilyn McHugh and Chris Kennedy, Dr.Uniyal/ Preeti, Navdanya Team. The Bhoomi Festival in New Delhi, on the 1st of October, 2016. Rice Harvest Festival to join the Navdanya community for harvesting more than 700 varieties of rices being conserved at the Navdanya Biodiversity Conservation Farm to celebrate World Food Day on the 16th, October, 2016. A Himalayan journey to visit Navdanya communities in Uttarakhand and learn about biodiversity, agroecology, local food cultures. For 10,000 years communities have produced food while enhancing biodiversity, building soil fertility and conserving water. In the last half century an industrial agriculture model with its roots in war chemicals has destroyed the Earth, destroyed small farmers and family farms and is threatening our health and the health of the planet. While providing only 30% of the food we eat, the industrial globalised model is responsible for more than 75% soil, water and biodiversity and has contributed to 50% of Green House Gases that has led to climate change. Agroecology and organic farming is the only future for our food systems. The one month course on the A-Z of Agroecology and Organic Food Systems combines 10,000 years of traditional knowledge, 30 years of Navdanya’s practical experience and the best of the new sciences of agrecology, participatory and evolutionary breeding, the role of biodiversity in sustainable food production and the links between agriculture, food, nutrition and health. Dr.Vandana Shiva will share with you her 40 years of research on ecological agriculture versus industrial food systems. She will take you through a 30 years journey of building Navdanya as an alternative to IPR monopolies, industrial chemical monocultures and free trade. Navdanya has been saving seeds for 30 years, you will learn about living seed systems, seed saving and seed sharing from the seed keepers. Dr. Salvatore Ceccarelli, the worlds leading participatory and evolutionary breeder will teach you how to produce your own seed. Dr. Av Singh, an agroecologist will explore the principles of Agroecology and the different agrecological systems. He will show how living soils have soil aggregate stability and how chemical fertilizers, over grazing and over tillage impact soil organic matter. You will have an opportunity to “design your living farm”. Chris & Marilyn Kennedy will facilitate your becoming a part of the food web in the laboratory and in the farm. The Navdanya team will work with you on land to equip you to become a builder of soil fertility through different methods of recycling farm organic matter for composting. Our international guests Andre Leu, President of IFOAM, will go into depth on the impact of pesticides on planetary and human health with latest studies from WHO and other scientists World renowned scientist Gilles- Eric Seralini & famous French chef Jerome Douzelet will join us for a dialogue on Culinary Pleasures or Hidden poisons. Even though most chronic diseases are related to food, the connection between agriculture and food are not made adequately. Navdanya has linked the seed to the table, the health of the soil to the health of the planet and the health of the people. The course will help you connect these dots. The creative work of serving the Earth, rejuvenating the soil and biodiversity also create living communities and local living food economies. Navdanya will share its experience of 30 years in creating biodiverse, organic, and fair food systems . Through workshops you will get an opportunity to plan your own transitions and participate in a global movement for safe, healthy, sustainable, and just food systems. 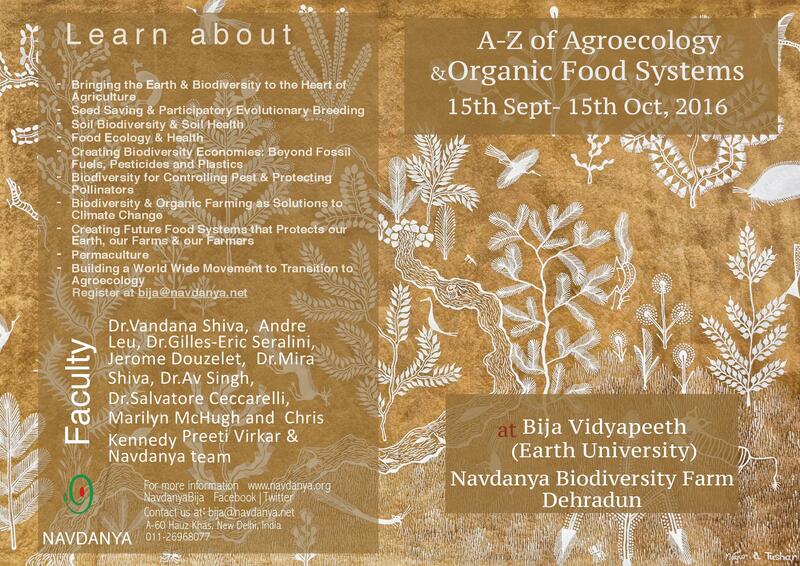 Students talk about the A-Z of Agroecology Course at Navdanya from Becket Films on Vimeo. 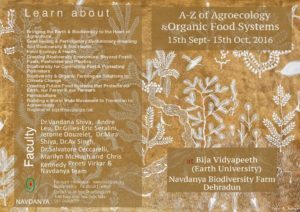 No Comments to "A-Z of Agroecology & Organic Food Systems — 15 September – 15 October 2016"